Text By Terry Long & Photographs By Philip Tulin © All rights reserved. Zion National Park should be a MUST for any photographer, as a minimum, four times a year...once for each season. Not too many people will agree with me but Zion is divided into four areas. The most visited and easiest to see the sights is the canyon proper. Here, you're at the bottom of the canyon and can drive along the Virgin River. You're also looking UP most of the time. Most of the more famous sights to be seen are located here. Court of the Patriarchs, Emeralds Pools, Weeping Rock, and Temple of Sinawava are a few of the more famous ones and are usually photographed at sunrise or early morning because they're on the western side of the canyon where they receive the early light of the sun. 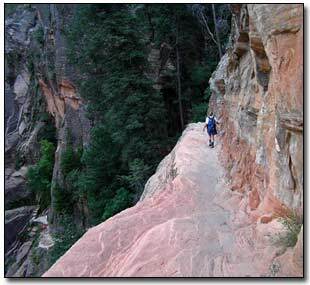 I'm sure you'd enjoy "The Angels Landing" hike for an adventure. If you take this hike, plan to leave very early in the morning as it will become very hot during the summer months and very crowded. Another adventure you might want to take is the "Narrows". You can hike in the river for miles and see some sights many people (like me) miss. You'll need a walking stick for this hike and plan for all day. Forget about it during spring because of the flash-floods. Another trail you can hike for a couple of days is the "Rim Trail". You can access it at "Weeping Rock". In order to visit this area during the summer months, you have to ride the shuttle busses. It's a very good system and well planned out. The second most visited area and also pretty easily accessible is the eastern portion of the park. If you come into Zion NP from the Springdale side, you have to go through the tunnel to get to the eastern side. The tunnel is pretty neat and I'd stop at the visitor's center to learn about the history of it. Anyhow, the eastern side of the park is completely different from the canyon. There are a lot of petrified sand dunes to explore. In fact, the whole region is more expletory in nature and offer more day hikes than anything else. My last visit to Zion was spent in this area more than in the canyon. Another visited area, but probably least visited, is the western side of the park. You have to exit the park and drive to the town of Virgin. From there you take the "Kolob" road northward for about eight miles. It's an entirely different type of park than either the canyon or eastern side. Lots of "grand scenics" are located here. But, you have to go visit "The Subway"! It's found by heavy hiking North Creek. The Subway is a narrow canyon that has been carved in a tunnel-like fashion by the waters of the creek. In one curve made by the river, it feels like you are in a tunnel, except for a narrow opening at the top. Plan for an all day hike for this hike. Also, you'll need to get a special pass and make your reservations at least two weeks in advance. And, the last area to mention is the "Kolob Canyons". To get to the Kolob Canyons you have to drive northward on I-15 and take the well marked exit. There are plenty of grand scenics but also a lot of trails to hike. You could actually hike from Kolob Canyons to Zion Canyon but it takes about two or three days. Hope you have a great time hiking Zion National Park.